Gastown’s award-winning tasting room and wine bar has revealed its latest round of favourite merchants to be featured during its upcoming Salt Cellar Series. Salt Tasting Room will open up its cellar for patrons to sip and sample exceptional artisanal cheese, charcuterie, wine and fine spirits from exceptional producers from across B.C. this summer. First up on the series schedule is Italian specialty food distributor Bosa Foods. Guests can expect their tastebuds to be titillated with a special sample of the producer’s best meats and cheeses. Bosa will also test out some of its newest products on the evening’s guests. Then in July, Salt will welcome whisky-loving women down to their communal tasting tables to try out a series of classics perfectly paired with a sampling menu. In August, one of B.C.’s most iconic wineries, Sandhill Winery offers guests a taste of their new releases. These unique dining experiences offer excellent value for those who appreciate tasting plates, exploring new wines and having them professionally paired. Tickets are $51.60, tax and gratuity included. Space is limited. All events begin at 7 p.m. sharp. For more details and to purchase tickets, check out the full schedule. Join us for a night of good food and great wine with one of our favourite food suppliers bringing in special artisan meats and cheeses. Bosa will introduce new products, and the foods showcased are paired with exquisite wines from around the world. Grab your girls and come on down for a night of whisky, meat and cheese as we explore the classics. This is a great chance for any woman who always wanted to learn more about whisky to do so in a fun and comfortable environment. Join us at our communal tables for the evening as one of B.C.’s iconic wineries offers guests a taste of their wares. 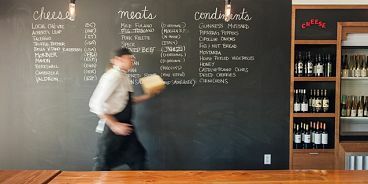 Salt is a tasting room specializing in artisanal cheese, small-batch cured meats and a dynamic array of wines, beers and sherries. Guests assemble a tasting plate from a selection of 10 cheeses, 10 meats and 10 condiments. The options change constantly, making it almost impossible to have the same Salt experience twice. For more information, visit www.salttastingroom.com.